The DL210 Biometric Lock by Shepherd was chosen as one of the "Best Of Innovations" for 2004 at the Consumers Electronic Show. The DL210 has been featured on ABC's Good Morning America, NBC's Nightline News, CNN Headline News, and many other major news publications across the United States as being named one of the industry’s best! Fingerprintdoorlocks.com has partnered with Shepherd as one of the central distribution points for the United States. We are the warehousing and service center for this fingerprint door lock. Shepherd has been designing and manufacturing biometric door locks since 1990 and is recognized as a world leader in the industry. 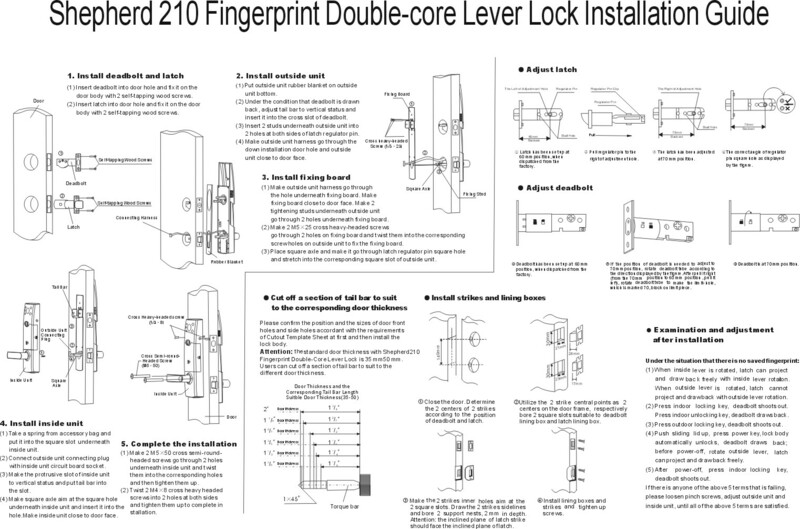 The DL210 Biometric Lock not only will fit your existing door setup, but was designed to stand up to the elements with years of convenient secure access. Easy to use, manage, enroll, and configure for up to 50 users! Buy one today and see why thousands of others have chosen this lock to secure their families and businesses! We are confident that you will like the DL210 or your money back within 30 days of purchase! Adjustable backsets (latch and deadbolt) may be chosen: 2 3/8" or 2 3/4"
Outside Dimensions 10 13/16" x 3" x 1 23/32"
Inside Dimensions 10 13/16" x 3" x 1 7/16"